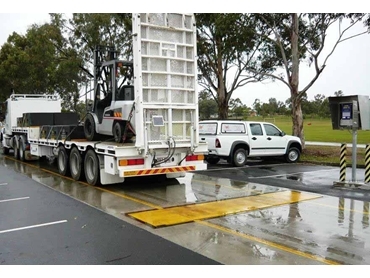 An in-motion weighbridge was recently supplied by Accuweigh’s QWM branch in Brisbane to the Australian Defence Forces (ADF) to ensure their vehicles complied with legal axle weights when driving on public roads. Installed at the Enoggera Army Barracks in Brisbane, Accuweigh’s Drive-n-Weigh 8000 automatic in-motion weighbridge offers high accuracy and can be trade approved for weighing gross vehicle weights. Measuring 4 metres wide by 1 metre long with a weighing capacity of 40,000kg, the in-motion axle weighbridge is installed in a shallow pit with 20 metres of existing concrete hardstand on either side to ensure accurate weighing of long vehicles. Accuweigh is a major industrial weighing equipment company operating branches in all mainland states and providing complete after sales service and support on in-motion axle weighbridges, full length weighbridges and all types of onboard vehicle weighing systems.